I use this in sociology, but it’s great for world history, as well. Assign students a culture to research. They will create a poster or trifold and bring in artifacts and food samples from that culture. 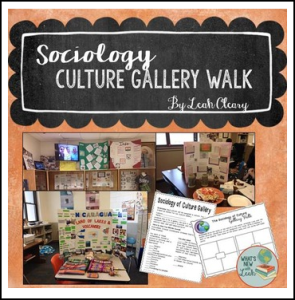 On presentation day, instead of standing up and sharing with the class,, students will set up displays around the classroom. Students will use the note handout to record information as they walk around the classroom, sampling the food and discovering information about different cultures. If you like this, be sure to check out my other sociology products. More sociology materials coming soon! • Look for the green star near the top of any page in my store and click it to become a follower. You will then receive updates about my store.